One of the main reasons many parents are reluctant to let their toddler’s creativity flow, is the mess it will inevitably make. However, you can solve this issue by creating a dedicated creation area. This designated area doesn’t have to take up a lot of space. If you have a spare room you can use, great! However, just a small area in a corner of the house will do. It can be made especially with messy play in mind. Place newspaper or a washable sheet down to catch any spills from paint or pens to ensure easy clean up. The space can be used for all kinds of creative play including painting, playing with blocks, making things out of putty or drawing and coloring in. When your toddler is engaging in creative play, the last thing you should do is cut their time short. Never rush them to be creative. Not only is creative play keeping them occupied (and quiet! ), but its also helping with their development too. So, don’t encourage your toddler to start playing creatively if it’s close to dinner time, or near a time where you need to pop out. Ensure they can play for as long as they want to. Teaching your toddler about colors is a great way to encourage their creativity. Experts recommend talking about and pointing out different colors as frequently as you can. If you go out on a little walk together, talk about the colors of the trees, leaves and sky. Introduce them to lesser common colors too such as Lavender or magenta. Explain how some colors work well together, while others don’t. Remember, your toddler’s brain is like a sponge so now’s the best time to teach them about the different colors. Ensuring your toddler has exposure to activities which use all of their senses will also boost their creative development. Ideally, this means heading outdoors so they can see, hear, smell, feel and potentially even taste different outdoor elements. Say you come across a fruit tree for example. Your toddler can use all of their senses to explore the fruit. Going to museums and libraries is also a great way to engage their senses. However, you don’t need to go outdoors to help develop their senses. You could also ask them to imagine a scenario. It could be a trip to the zoo. Ask them what animals they might see, what sounds they make and what they may smell while they are there. These are just some of the ideas you can use to encourage your toddler to use all of their senses. You don’t need to spend a fortune on creative toys, there’s plenty of things lying around the home you can use. Empty toilet paper rolls, plastic tubs and cardboard boxes can all be used to create things. You could use a large empty cardboard box to create a little dolls house. All you need to do is cut out doors and windows, then let your toddler decorate the house however they desire. Empty toilet tissue rolls can also be used to create a little family. Just add cotton wool for the hair, draw on faces and stick on some paper clothing, then they can be used for imaginative play scenarios. Building blocks are fantastic for encouraging creative play. They’re so simple, yet toddlers love to use them. They can let their imagination run wild as they build stuff with the blocks. They can also be used to teach about colors and shapes. If you buy different colored blocks, you can ask your toddler to sort them out into same-colored stacks. Toddlers LOVE dramatic play! However, it’s difficult for them to do it alone. So, get involved and let your inner thespian come out to play for a while. You and your toddler can create all kinds of wonderful, imaginative scenarios. Not only does dramatic play help to build creativity, but it also acts as a great bonding experience and can really help to build up their confidence too. It can be tempting to interrupt your toddler’s creative play sessions. Whether it’s because you feel they’re doing something wrong, or you want them to do something else for a while – interrupting their creativity sessions can deter them from being creative in the future. There is no right and wrong way for them to get creative. So, whatever their little imaginations come up with, avoid telling them it’s incorrect or they should be doing something else. This is their creativity and it’s a very beautiful thing. Of course, although creative play is important for your toddler’s development, you need to make sure they’re getting some time away from it too. No toddler wants to be creative 24 hours a day. So, let them watch television for a while and play without expectations. Remember, anything that you try and force your toddler to do, will ultimately end up with them refusing to do it. So, keep creative play sessions relaxed and never force anything. 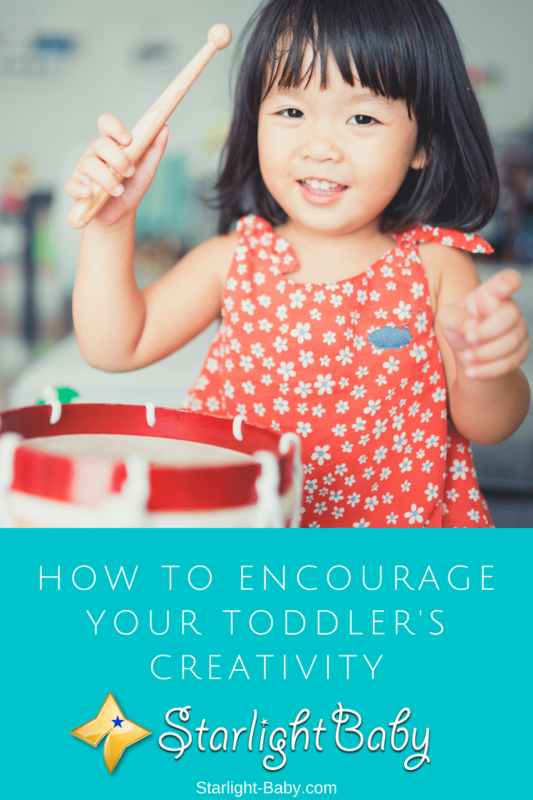 The above are just some great ways you can encourage your toddler’s creativity. You don’t need a huge budget and the great thing about creative play is that it keeps them occupied for potentially hours! So, if you haven’t already, now’s the time to start encouraging your toddlers creativity. One thing that I learnt about toddlers is that it’s very important give them time to develop their mind and creativity without too much interference when they are trying to learn. It’s best to allow them figure out some things on their own. This would help them to have confidence in themselves. Giving the kids the opportunity to become creative at things is the best that they can get the needed confidence as they grow up. I always tell people that once we try to control a child in almost everything they do, they will lack the confidence to take decisions on their own. I couldn’t agree more with what you said, Martinsx. Allowing them to figure things out could hugely help develop not only their creativity but their critical thinking skills, too. Overtime, the use of building blocks is one that can enable the toddler to get active as we can see from series of things that is happening. Creativity is all about thinking out how to set those blocks and that is helpful for kids. Also, giving the toddler while playing is essential for it aids the creative mindset that they build. Giving the child the freedom to think about what he/she needs to do not only helps them to be creative but also helps them in developing their decision-making skills. In this day and age of gadgets, when most children just sit and click away, a lot of them may not be able to develop this kind of skill. Poor kids. I have a toddler in my house. Based on my observation and experience, your toddler needs a large space to express his creativity because you never know what he actually wnats to do. having interactive toys, letting them watch animal videos and rhymes will also help. That’s true, vinaya, a creative child needs all available space because he/she needs room to explore and grow.